You Looking for Wine Delivery or local liquor stores in Greenwich CT? 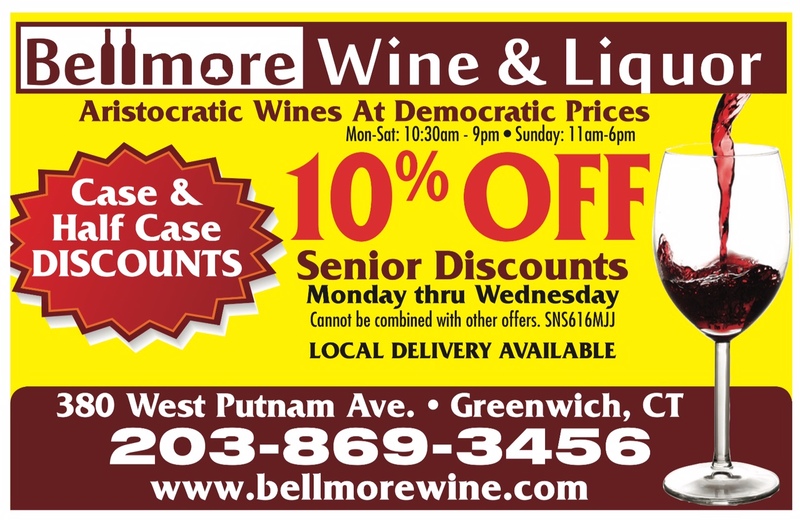 Bellmore Wine & Liquor has been doing business in Greenwich, CT for more than 60 years and the locals keep coming. It is known in the neighborhood as a friendly shop offering a great selection of wines, variety of spirits, and beers. The store operates from 11AM to 9PM Monday through Saturday, and from 12pm to 5pm on Sunday. Almost every weekend, you can stop in for a wine tasting offering you an opportunity to try new wines. If you are interested in having your order delivered, please call us anytime. Stop in and for a wine tasting and have a look at all of the wonderful selections offered. We’ve been located right here in Greenwich CT and serving the community for over 60 years with the best wine and liquor selections and the coldest beer. If it’s liquor stores in Greenwich CT you’re looking for, then stop in and view our complete selection. We can deliver special orders and offer discounted wine cases. Bellmore Wine & Liquor store in Greenwich CT invites you to stop in for a wine taste. Sample our selections and ask about our discounts. We can deliver locally and would love to be your provider of wine and spirits in the Greenwich CT area. We thank you for choosing Bellmore Wine & Liquor in Greenwich CT.
Ha! Had to leave a review after finding Bellmore here! My favorite liquor store in the area hands down. The best discounts I’ve seen in Greenwich. Would recommend. Bellmore has it all and I’ve been going for over a year now. Very good selections of wines that I have been sampling and the owner is always happy to greet his customers. Vlad is awesome! Just stop in and he’ll make you a returning customer! Really great place. Tiny but packs a punch lol. They have just about everything I need and have been a customer for years now. Great store, prices are very good . Large selection. I was surprised at some of the great wines that I found there. Would recommend the store….. owner makes you feel like an old friend…..
My favorite liquor store in Greenwich. Good prices and a very nice well rounded selection. Started going here a few months back and the prices are definitely much better than a lot of the other liquor stores in the area. Only reason I give it 4 stars is because parking can be tricky at times. Other than that it’s a good choice. Great local store with a great owner. The store has been in the Greenwich area for a very long time. Nice selections and they do deliveries! 5 stars. My go to for years. The owner is a great guy who knows all of his local customers very well. Great selections and very good prices. You can’t miss these guys when you drive by. Great store, great owner and lots of fantastic options. Great service, best prices, customer oriented store!! !